Hot Topic: Can Nuclear Energy Be Part of a Sustainable Future? For our latest event we had the absolute pleasure to host our first ever ‘Hot Topic’ event series, and boy did it go off with a bang! We had Professor Wade Allison (Pro-Nuclear supporter – Emiritus Professor of Physics at Oxford University) and Neil Crumpton (an independent avid campaigner for renewable energy, and against the new build of nuclear power plants). With 15 minutes each, both sides were raring to go, informing the audience of a wide range of scenarios and reasons for and against nuclear energy. Wade Allison was first out of our two speakers, emphasising the statement that prospects of nuclear energy have been blocked due to attitudes towards it – taking a peculiar but rather interesting pre-historic example where people during those times did not shy away from fires being in homes rather they studied it to understand it better. Wade’s argument was exemplified from that example: we need to study nuclear energy better than shy away from it. 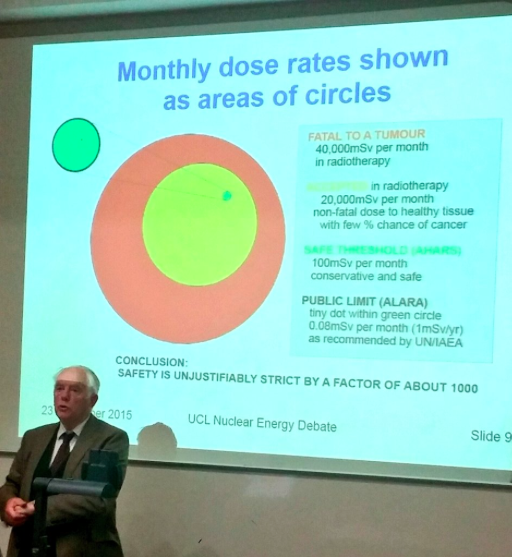 Of course the worry over ‘dangerous’ nuclear waste radiation having to be buried underground remained, to which Wade argued that nuclear waste is not dangerous as it is claimed to be as there is a very obvious solution: evolution. Drawing examples from Fukashima he argued that most of the deaths were caused by the displacement of the locals rather than death by radioactive waste. In concluding Wade’s 15-minute talk, the main point that can be drawn from it is: the aversion to nuclear energy is a ‘phobia’ (as argued by Wade) where it stems from the danger feared over nuclear radioactive waste, this phobia needs to be addressed and re-evaluated to begin understanding Nuclear Energy as a viable option for the future. Neil, our second of our two speakers took the stage next. His main vantage point was that renewable energy is a much more viable option than nuclear energy – going on from the fact that renewables produce no greenhouse gases except in production which are negligible and a much safer option than radioactive waste. Giving the audience a vast amount of figures on renewable energy for example 45% or 600 TWh/y from offshore wind (in an area 2/3 times the size of wales in contrast to the ‘meek’ 75 GW of nuclear energy – Neil conveyed his point across to the audience that renewable energy is the way to go. 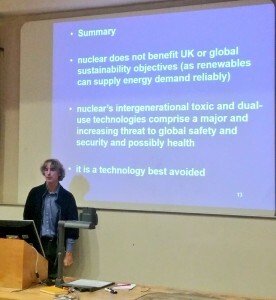 Neil presented a very stimulating rebuttal the Wade’s talk, his main point is that nuclear energy does not benefit the UK and neither the world in terms of sustainability objectives that need to be attained. Or put succinctly, in Neil’s words, nuclear energy ‘is a technology best avoided’. Overall both speakers put forth a very convincing argument to support their claims for/against the suitability and sustainability of nuclear energy. We suggest that based on these two convincing cases, it is for you to decide whether or not nuclear energy can be part of a sustainable future.